PRESS RELEASE - Arrest in February 25, 2018, north Fremont armed robbery. On February 25, 2018 at approximately 11:05 a.m., an armed robbery occurred at the ‘A1 Quickstop’ located in the 3800 block of Lake Arrowhead Ave in Fremont. Two suspects, one armed with a firearm, entered the store and robbed two victims at gunpoint. The suspects stole US Currency from the register and other items from inside the store. Detectives from the Fremont Police Department Crimes Against Persons Unit quickly began to investigate the incident. The investigation revealed the same suspects were believed to have also committed additional recent armed robberies in other cities and jurisdictions. Fremont detectives worked closely with the San Leandro Police Department, the Alameda County Sheriff’s Office and the Vallejo Police Department to share information regarding the cases and suspects. Community camera license plate readers and surveillance video from the victim store provided suspect leads in the case. The investigation led detectives to Dominic Sears (22 year old male; Vallejo resident), as a potential suspect in the case. At the time Sears had an active felony warrant for his arrest behind a separate and unrelated investigation. On March 15, 2018, suspect Dominic Sears was arrested in Vallejo, by the Vallejo Police Department’s Crime Reduction Team. At the time of his arrest Sears was in possession of items which connected him to additional robbery cases. "This was a great effort by many to solve this armed robbery so quickly," said Fremont Police Lieutenant Michael Tegner. "Our detective's ability to work with outside agencies and arrest the suspect began with the use of community-based video surveillance cameras and automated license plate readers. Visual evidence is always a plus and incredibly invaluable to the prosecution." On March 19, 2018, the case was presented to the Alameda County District Attorney for review. Dominic Sears was charged with felony robbery (PC 211) and an arming enhancement for being possession of a firearm during a robbery (PC 12022(a)(1). 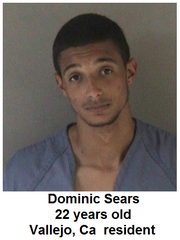 Sears is currently in Alameda County custody behind the robbery series. This remains an active investigation. Anyone with information regarding this case is encouraged to contact the Fremont Police Department's Crimes Against Persons Unit at 510-790-6954. We will also accept anonymous tips via text. Text TIP FREMONTPD followed by your message to 888-777, or via the web at https://local.nixle.com/tip/alert/6216337.